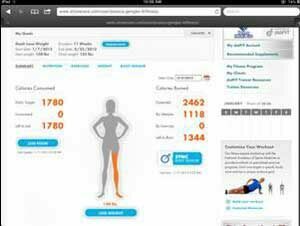 The online interface is where you will manage your weight loss through the dotFIT website. You’ll download the data from your armband/wristband device via the web. Our program then calculates exactly how many calories you've burned, letting you know how many calories you can consume to maintain your weight and fitness goal. We give you custom menus to help you figure out what to eat and there's also an easy to use food logging program with thousands of known foods in an auto-search database. It makes keeping track of your food intake to match your calorie output a breeze. It's like having your very own dotFIT pro at your fingertips. And the best part; you get to eat the foods you love and still lose weight! Don't want to log your food? No problem because you will have downloaded your calorie burn and your weight, the program can calculate for you on a weekly basis what your actual average calorie consumption was per day. No more denial! Armed with this data, you'll know exactly what you need to do to get back onto your calorie deficit goal. The web interface will show you your real-time status any time of the day. You'll see your activity minute-by-minute, every step you’ve taken and your progress toward reaching your calorie deficit goal—your magic number for losing weight. DotFIT Web Access is Free to Yakima Athletic Club/YAC Fitness Members. Please fill out the information below to be registered today!